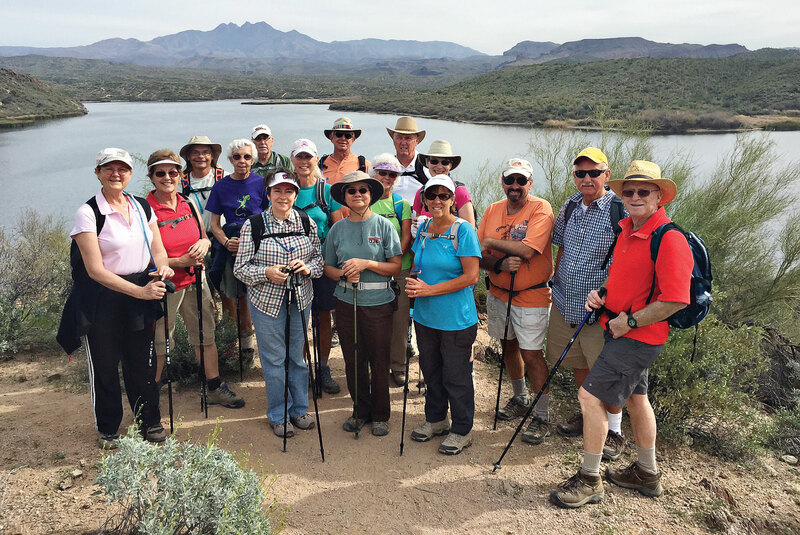 On February 20 the Robson Ranch Recreation Hiking Club took the Butcher Jones trail on Saguaro Lake for a wonderful hike around the east side of the lake. Laurie Waluk led the hikers while Jim Price took the sweep. Laurie was one of the original hikers who started the RR Hiking Club as it is known today. Saguaro Lake, set in the Sonoran Desert, is part of Tonto National Forest and is rimmed with canyon walls. And as the name implies, the shores of the lake are studded with majestic Saguaro cacti. The lake is formed by the damming of the Salt River at Stewart Dam and is well loved by boaters and fishermen, especially in the summer months. However, in the winter the boaters thin out considerably, and some nice hiking opportunities open up. The Butcher Jones Trail along the lake edge was an excellent way to experience the area without a boat. It was a beautiful hike with trees, reeds, water, desert plants and a few flowering trees. The first half mile of the trail has a railing and is partially paved. After that the trail contours around the various coves of Saguaro Lake, providing some nice views of the lake and surrounding Sonoran Desert. After passing Peregrine Point, the hike contoured around a small bay and started a climb up to a small hill. This hill provided nice views before descending again to just above water level. After Camper Cove the trail heads away from the lake into the desert and over a small saddle to good views of the four peaks and Burro Cove. Soon after this point the hikers made a turn around and backtracked out. It was yet another great hiking experience! Note: In 2007 two Michigan girls, Robson Ranch residents Laurie Waluk and Sandy Christopher, with a desire to hike Arizona began to look for people to join them. Soon they connected with a group from Casa Grande and hiked with them to the end of the season. Later on Nancy Stogsdil and a few other women joined the group. In the fall of 2008, men and women of Robson Ranch formed their own hiking group and Pat Carter, an avid hiker, became their first leader. Later on Dave Anderson joined as a leader, and in 2010 Jim Price came aboard; others followed. Today, in addition to Jim Price, other leaders include Margie Poplawski, Fred Koser, Mike Campbell, Karen and Allie Woodcock and Kent Jenson. Thanks to all the leaders past and present!